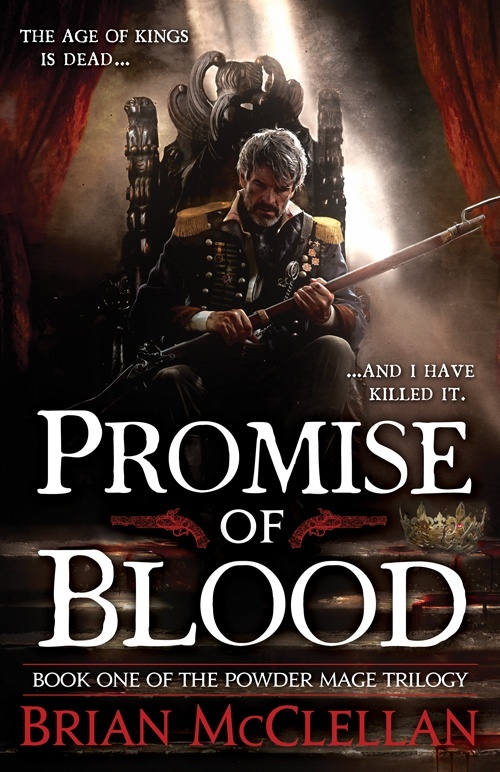 With Promise of Blood, Brian McClellan has dragged a classical fantasy world, kicking and screaming, into the revolutionary era. Be it industrial, political, cultural or otherwise, this is no longer just another Middle Earth or Westerosi analogue – this is their future. Field Marshal Tamas has, as the book opens, essentially started the Revolution. He’s removed the king and his classically realised cabal of “Privileged” (ie: wizard bodyguards) and installed a ruling council, made up of various faction heads from each sector, with himself leading the charge. With their dying breaths, each member of the Royal Cabal speaks a cryptic message. Tamas brings in seasoned detective, Adamat, to investigate what this message means – and so, we’re off. Thrown into the mix is Taniel Two-Shot, a powerful “Powder Mage” (more on this later) who has his own part to play in events, being Tamas’ estranged son. Oh, and there might just be a few Gods involved too. As I said above, this really is a classical fantasy world pulled into a revolutionary, 19th Century-esque setting. McClellan borrows heavily from history, particularly the French Revolution. This type of “Revolutionary” epic fantasy has been done before to different degrees – Brandon Sanderson’s Mistborn series, for instance – but I’ve never seen an author really go for it and make every element of the setting play into the theme. This is not just a mirror image of the French Revolution in a fantasy world. The industrial revolution is felt in every area of the story, from the importance of the Printing Press to gunpowder. The implications of revolutionary actions are explored in enough depth as to make it interesting and well-rounded, but never boring; financial obligations from previous alliances, the difficulties of food rationing and the inevitable organisation of opposing royalist forces are all here. But McClellan keeps the pace moving from set piece to set piece in a novel which consistently engages with its ideas but never gets bogged down in them. Industrial, political and cultural. But what about the magical revolution? This is a fantasy, after all – and the magical revolution is felt just as much as the others. Like Sanderson before him, McClellan has created several different magic systems here. 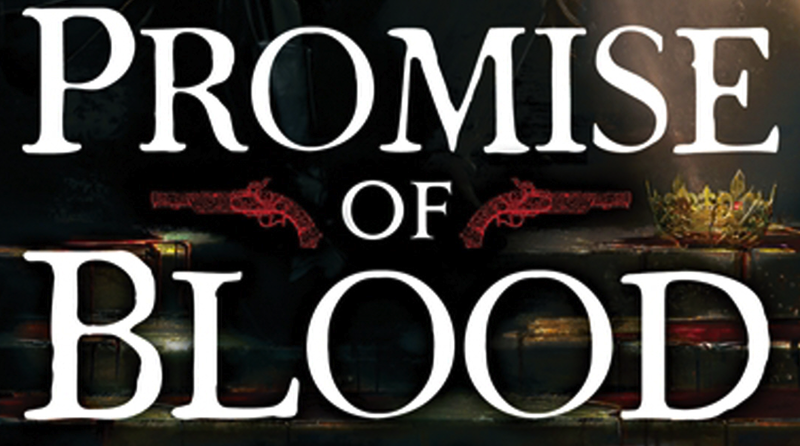 I’m not typically a fan of books that revolve around magic systems (the Wheel of Time may be enough for the rest of my life in that regard…) and much has been said about how Promise of Blood revolves around these systems. But they really are not superfluous. They’re never explored in extraneous detail and deus ex machina isn’t an issue. There’s the aforementioned Privileged, who are basically element wielding wizards – some are more powerful than others. There’s the Knacked, which is less of a magic system and more of an interesting added element, whereby individual, typically non-magical people have one very specific “knack” such as not having to sleep or having a perfect memory. And finally, there are the Powder Mages. Sniff a little gunpowder and you’re well on your way to manipulating bullets and blowing up barrels. It’s all very simple and very, very entertaining as McClellan uses the differences between the classical Privileged and the newer, more industrial Powder Mages, to give archaic and modern ideologies a literal counterpart on-the-page. In terms of character here, there are three main point-of-view characters. Field Marshal Tamas, Investigator Adamat and Taniel Two-Shot. Each have their own sub-plots that link in with the other to form the main plot of the novel. It’s one which is best left for the reader to discover for themselves as I was left gasping for breath every other chapter. At different stages in the novel I enjoyed each of the main three characters. They all feel well realised (Tamas in particular has history, and you can read it between the lines). There is a fourth point-of-view character, Nila, who I’d have liked to have seen a lot more of. The lack of female characters in the roles of protagonists is a bit disconcerting and is something I’d hope to see expanded in the next book. The cast of side characters are excellent – Olem being a particular highlight – with one seemingly minor character (Vlora) having what feels like her own story off-the-page. Again, this is something I’d like to have seen more of as so much of the main character’s motivations relate to her, but yet she’s rarely seen “on-screen”. Promise of Blood really did live up to my expectations. It’s a frantic read that whole-heartedly leaps into its premise without short-changing the reader. This *is* a book that takes the framework of epic fantasy and does something exciting with it. For a debut – something I keep having to remind myself of – this is an assured and accomplished epic fantasy novel. I’ve become a little disillusioned with magic-heavy epic fantasy recently, but Promise of Blood has instilled faith that it can be done well alongside a plot which is engaging, satisfying and, beyond anything else, entertaining. 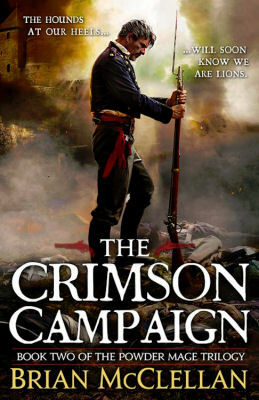 The Crimson Campaign can’t come fast enough.